From left are Dr. Dana Clawson, dean of NSU’s College of Nursing and School of Allied Health; Logan Webb, past Shreveport SGA President; NSU President Dr. Chris Maggio and Ryan Harmon, current Shreveport SGA president. The NSU Shreveport campus is located at 1800 Line Avenue. 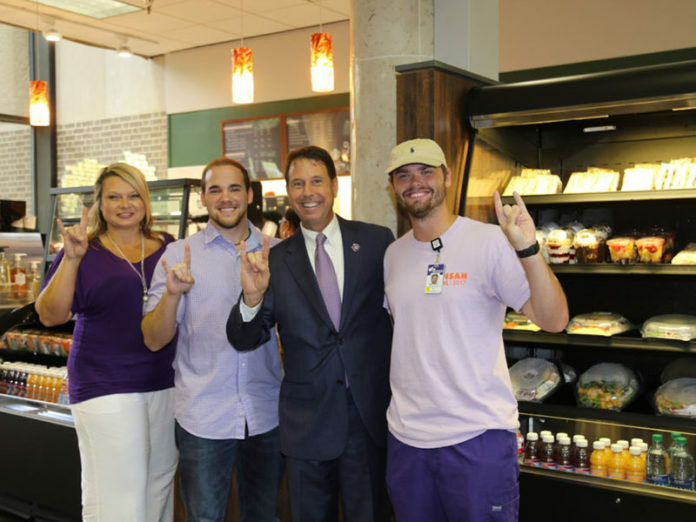 Northwestern State University’s College of Nursing and School of Allied Health in Shreveport celebrated the opening of Café DeMon II, a new coffee shop located adjacent to the library in the campus’s main administrative building. Café DeMon II will service more than 1,000 students and 60 full-time faculty who are often unable to leave campus for lunch or breaks with Starbucks coffee, sandwiches and snacks. The project was initiated by the CONSAH campus’s Student Government Association, who will share profits from the café. The grand opening took place during orientation for first-level clinicals students.